where a specific answer exists and I could ask that question naturally of a computer using the language I might if I were talking to another person. In the short-term this kind of technology could be used to streamline existing customer support functionality. In the longer term this might evolve into a more general purpose human-computer interaction; more conversational. 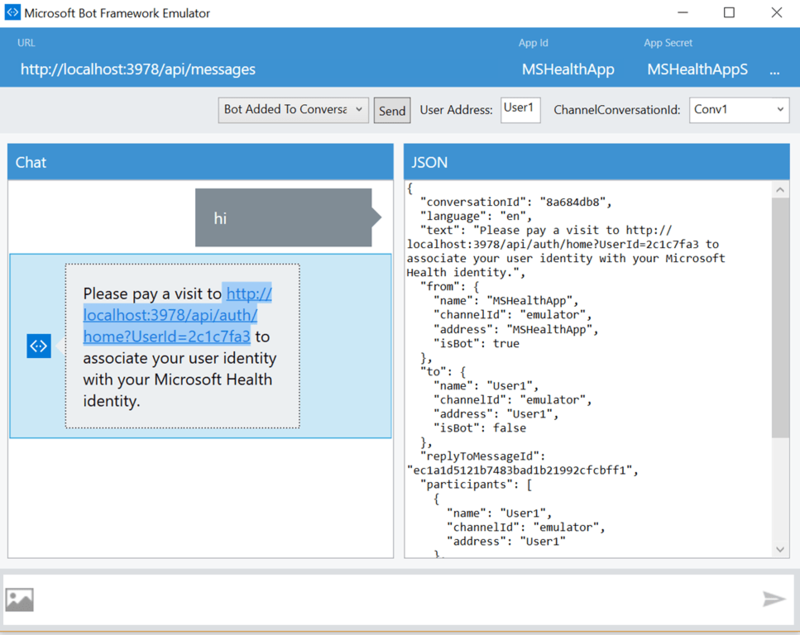 Microsoft announced their Bot Framework and associated tools at the recent Build conference and to kick the tyres of this offering I thought I would try to answer the aforementioned questions using the Bot Framework and the Microsoft Health API using some of the code I wrote for a previous post (see http://peted.azurewebsites.net/microsoft-health-api-uwp-sample/). 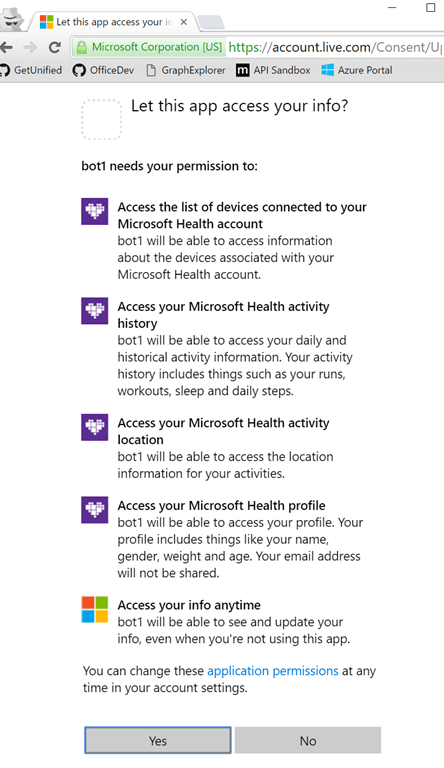 The data I can get back via the health API has been collected over time using my Microsoft Band which can be used to track sleep, running, cycling, general workouts, etc. 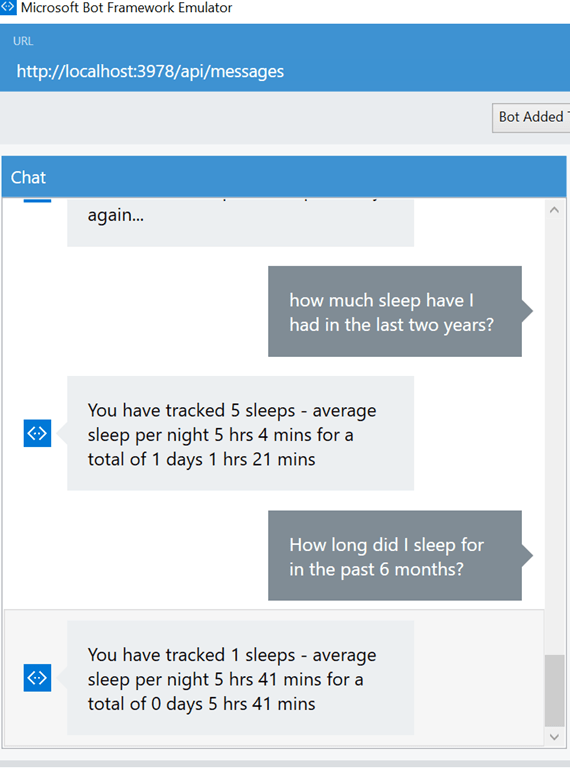 I’m not going to delve into what the Microsoft Bot framework is as that has been covered here https://blogs.msdn.microsoft.com/uk_faculty_connection/2016/04/05/what-is-microsoft-bot-framework-overview/ – instead I’m just going to cover some of the aspects of this that I found interesting and point to the project I created to get started with bots. creates an ASP.NET Web API project with a Messages controller which has an http POST action to receive messages from a user communicating with your bot. 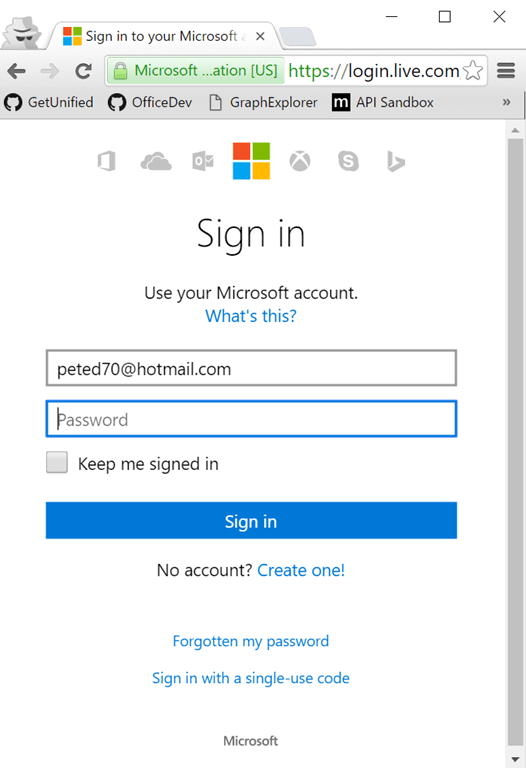 Your bot is authenticated using an app id and app secret set up in the web.config file. 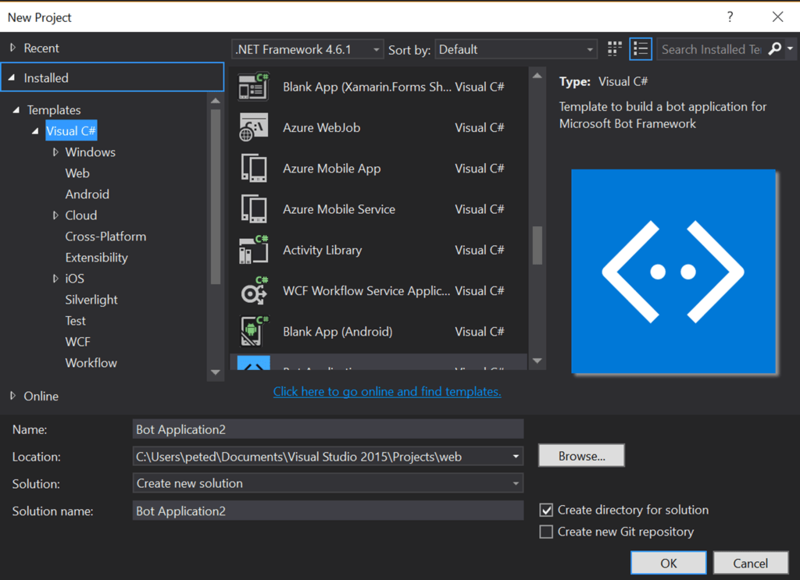 If you press F5 now to run the bot your web API will be hosted locally and you will be able to connect to it using the Bot Framework Emulator (please see http://docs.botframework.com/connector/getstarted/#getting-started-in-net for installation and set up instructions). 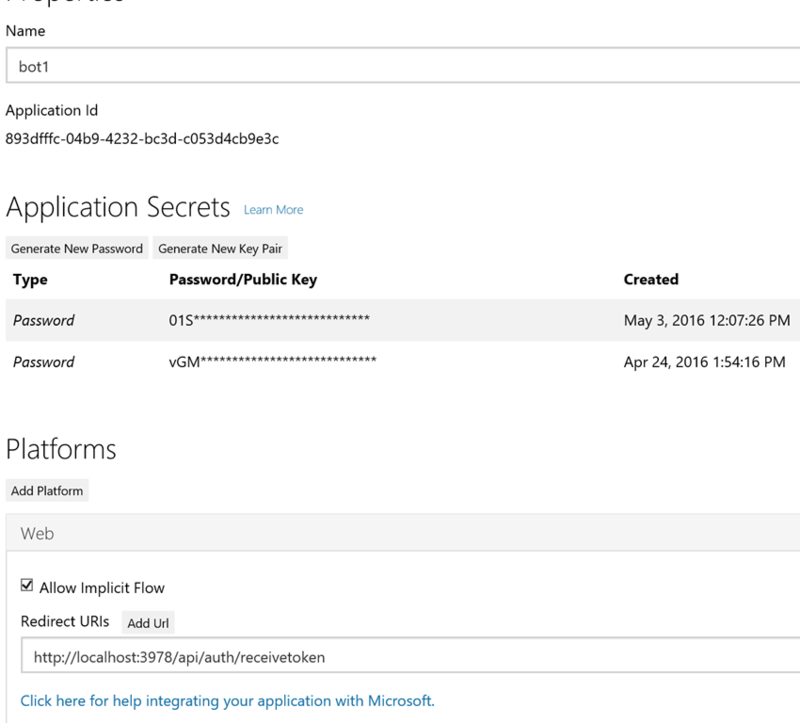 Subsequently, we have the access token which we can send in the auth header for requests to the Health API. Notice also that the time durations in the above image are also highlighted. This is happening because I added the Bing pre-built entity for Date Time to my app. Imagine the myriad of different ways in which time durations and instances in time can be specified using natural language! 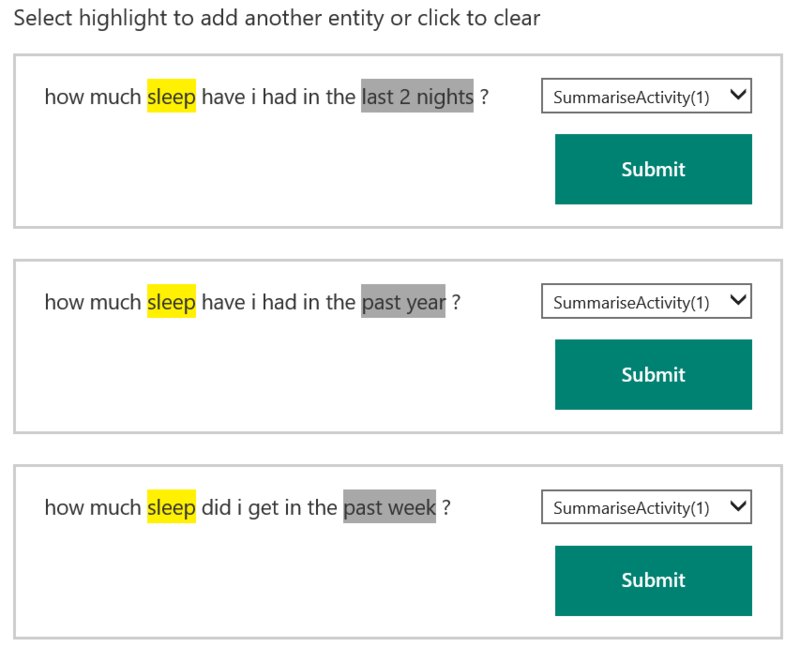 When I query the Machine Learning model for this it should identify an activity and a time period – if for some reason a particular query isn’t recognised I can take the failing query and train the model using it so that it will work moving forwards. Once the model is trained or re-trained you can publish it either to a temporary endpoint for testing or to be hosted in your Azure subscription. The API would then be available over a HTTP, REST endpoint.